Discussion in 'Amateur Radio News' started by W0PV, Nov 1, 2018. The Reverend Paul Bittner, W0AIH, of Fall Creek, Wisconsin, died doing what he loved on October 31, when a tower-climbing mishap claimed his life at his well-known antenna farm. The ARRL Life Member and Maxim Society member was 84. A member of the CQ Contesting Hall of Fame and retired Lutheran pastor, Bittner was a well-known and respected figure within the Amateur Radio community and a prolific contester and DXer. His call sign was nearly always present in most major operating events, and even in a few lesser-known contests, and news of his tragic death and condolences and accolades quickly spread among those who knew him best. “No one was more generous, loving, and encouraging to others than the Reverend Paul Bittner,” said Mike Lonneke, W4AAW, in a post to the Potomac Valley Radio Club (PVRC). “He called me last week to chat about what he and Mary were up to, like getting material together for their always long and hilarious Christmas newsletter. He also knocked me out with the latest of his funny experiences in his ‘Rent-a-Rev’ sideline.” Bittner officiated at the June 2 wedding of two well-known midwestern contesters. Bittner was licensed in 1949 and held the same call sign ever since. He and his wife, Mary, WB0PXM, moved in 2000 to “The Farm,” a 120-acre spread in west-central Wisconsin. The first of the more than 50 towers began sprouting there before their arrival in 1982. As a ham, he enjoyed multi-multi contesting and DXing. 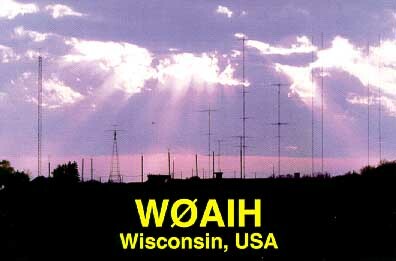 His favorite band was 160 meters, and his favorite contest was the CQ World Wide DX CW Contest. Bittner’s son-in-law — Paul Husby, W0UC — operated VHF contests from The Farm and was a multi-multi regular as well. Contester and former ARRL staffer Dave Patton, NN1N, described Bittner as “such a good man and truly great ham.” W1AW Station Manager Joe Carcia, NJ1Q, noted that Bittner had volunteered to operate as W1AW/9 as a headquarters station in the 2019 IARU HF Championship to celebrate his decades in ham radio. NCJ Editor Scott Wright, K0MD, said that Bittner helped to build stations for many midwestern hams. “He was a mentor to hundreds of hams, and his enthusiasm for contesting was infectious,” Wright said. Bittner had said he wanted to be buried with a bible, a telegraph key, and a climbing belt. Other threads on QRZ appeared first at these links, but I feel that Paul deserves to be on the Zed front page too. 2E0EUG, KB2QQM, KT4RK and 4 others like this. Heard him calling VP6D a week or so ago. W3KKO and N4FZ like this. UN-BELIVEABLE!!! I'd just WORKED PAUL A FEW DAYS AGO!!! WHOA!!! He like many of we smaller guys in Amateur Radio have done a lot for Hams that "GO UN-NOTICED", but what I'm saying is he GAVE AS MUCH TO THE HOBBY AS A LOT OF US HAVE AS WELL!!! HE'LL BE MISSED!!! 2E0EUG, N4FZ, W6GH and 1 other person like this. Final 73 to Paul thanks for being a great friend and Elmer ! N4FZ, W6GH and WZ7U like this. Thanks for posting this as NEWS John; absolutely appropriate. BTW, Paul was also a MAJOR DX'er, as well as contester... the TOP TEN DXCC on mixed, at 390 countries.... amazing! Elsewhere, the issue of climbing safety has come up. Paul was an expert climber and was never lax on safety precautions. If one were to speculate, it is likely that sudden health issues were the cause, IMO. Unless we hear otherwise, there is no new 'lesson' to be learned on tower safety from Paul's unfortunate passing. He loved to climb. A great man, already missed. W2JAD, WA7PRC, WA8FOZ and 6 others like this. Paul was an expert climber and was never lax on safety precautions. If one were to speculate, it is likely that sudden health issues were the cause, IMO. Unless we hear otherwise, there is no new 'lesson' to be learned on tower safety from Paul's unfortunate passing. Precisely my thoughts too Chip. Seeing as how early Paul got started with towers, and how long his career lasted, he probably had more climbs / hours on the iron then virtually anyone else including pro's. Paul would have been 85 years young this Christmas. I hope to be just sittin' in the radio operators chair at that number, still climbing so vigorously is hard to imagine. Check out this drone video of the installation of a 75m 3el Yagi @ W0AIH. The guy in RED way out on the boom is Paul. This was two years ago when he was a youngster. AK4QR, AJ4GQ, DL9KR and 7 others like this. I live just a few miles from Paul like so many others he and I have been friends for twenty years. I was just there Friday operationg 20m during the contest. Anyway another friend and local ham was on-site working ground support while Paul was up the tower just before he was killed. I spoke to him not long after the accident. He told me it was gear failure. What actually failed? I thought I read something about a pulley? I wasn't there, I was told from the ham on the ground it was a pulley.